Nebraska is at a pivotal moment, with crucial decisions to make about its energy future. According to research by the Center for Rural Affairs and Synapse Energy Economics, the Nebraska Public Power District (NPPD) is well positioned to stop using coal to generate electricity at the Sheldon Station Power Plant in Hallam, and increase their investment in money-saving energy efficiency, as well as abundant renewable energy. Please contact the NPPD board member representing you. Click here to find your NPPD representative and their contact information. To keep its doors open, Sheldon Station would require considerable retrofitting to comply with environmental regulations. It could cost as much as $226 million in capital costs alone. If Sheldon Station continues to be operated as it has been in the past, it will accumulate losses of over $1.3 billion by 2042. Rather than spending billions on outdated coal-fired generation, those hard-earned ratepayer dollars could fund projects that would benefit small town and rural communities many times over. Nebraska is the 7th largest energy consumer per capita in the United States. 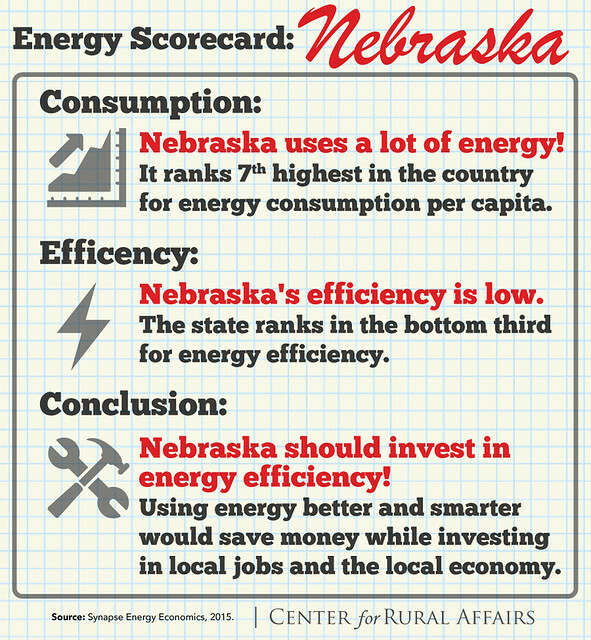 The American Council for an Energy Efficient Economy (ACEEE) consistently ranks Nebraska in the bottom third for our state’s efforts to use energy more efficiently. This does not need to be the story we tell about ourselves. Every dollar spent on energy efficiency improvements creates up to four dollars in local economic benefits. Keeping main street strong requires us to do better. We cannot afford to miss the opportunity to generate energy in a way that prioritizes the health and vitality of small-town communities, good jobs, and conservation of our resources. Though hardly tapped, Nebraska has the 4th largest potential for wind development in the nation - enough to supply over 118 times Nebraska’s current electricity demands. The Nebraska Public Power District (NPPD) provides power to over 89,000 customers across 92% of the state’s counties. If NPPD fails to make strategic investments that benefit its ratepayer-owners in small-town communities it will miss the opportunity to create benefits that public power has the potential to offer. Continuing to invest rate-payer dollars in the coal-fired Sheldon Station represents a missed opportunity. Nebraskans deserve to see more of their money stay closer to home. Rural and small-town communities are missing out on the benefits of renewable energy and energy efficiency, and deserve energy generation that benefits communities now and in the future. Please contact the NPPD board member representing you. Click here to find your NPPD representative and their contact information.